Why rent a hotel rooms?! When you can get Disney Golf & Tennis Resort Villa Suites only about 10 minutes from Disney Worlds Animal Kingdom! 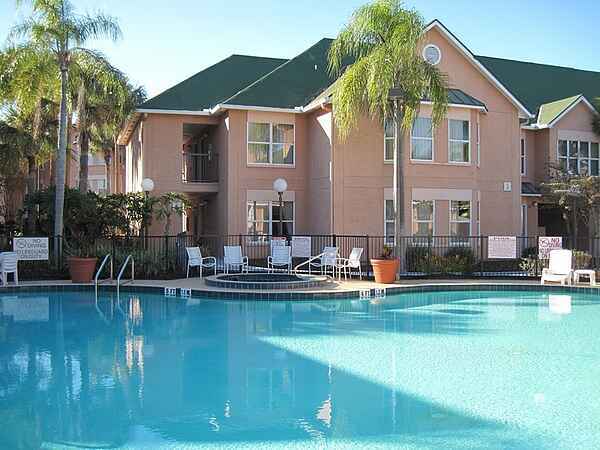 We are happy to offer you accommodation with “the best location” only 10 minutes from Disney World. You will be very pleased staying in our Estate creating nice memories for a lifetime. Highlands Reserve Golf Club overlooking the golf courses and less than 200 yards from the golf club house. The area is surrounded by hundreds of restaurants, bars and outlet-stores and less than a mile to Publix grocery store. Enjoy a pool just outside your door and large entertaining patio for BBQs. Close access to tennis court, community pool, playground and pro shop. The Estate is a great vacation paradise with its own pool overlooking the golf course in tranquility. The Estate consists of 5 individual suites for total privacy. The Estate is perfect for business colleagues attending one of the fairs or exhibitions at the Orlando Convention Center and offers superior comfort, space and privacy. Whether attending one of the exhibitions or visiting on vacation, you will feel that you are in the “real Florida” and in an oasis of calm. Most of your neighbors are also European or northern Americans. The Estate is close enough to the Beaches of Tampa Bay to go back and forth during the same day. The pool area in the back of the Estate is facing the golf course and has pool chairs and sunbeds. Famous water parks are Disney Worlds Blizzard Beach and Typhoon Lagoon which are only about 15 minutes away. Wet’n Wild is another popular water park for the whole family. You may also walk to Florida’s favorite grocery store: Publix which is only about 800 yards away. You will also find your favorite restaurants such as Applebee’s, a Golfer’s Pub, Indian restaurant, Quinsy’s Subs, Mia’s Pizzeria and Regal Palm’s full service restaurant. By staying in the Estate it is totally feasible to just stay here and no need hire a car if you desire, but a rental car is recommended to venture out to all the attractions and great outlet shopping. If you choose not to rent a car we will provide you with phone numbers to local taxi companies. Golfers can enjoy being only 150 yards to the Golf Club House, Driving Range and the First Tee. The home course is one of Tampa-Orlando’s most popular golf courses. It is one of a few courses you are still allowed to walk on without having to take a golf cart. This championship Mike Dasher design gives you pine tree-lined fairways reminiscent of the Carolinas, open spacious fairways likened to the great Scottish courses, and a bit of old Florida with citrus trees along the countryside. Large, fast, undulating greens make this course challenging and fun for all levels of golfers. Highlands Reserve Golf Club was nominated by Golf For Women Magazine as one of their 50 top courses for 2002. Rated 3.5 Stars by Golf Digest's "Places to Play" guide and consistently ranks Highlands Reserve as one of their most requested golf courses year after year as chosen by their customers. Enjoy the luxury of a Health, Fitness Center and SPA within walking distance, only 800 yards away, or a community Olympic size swimming pool for exercising laps, only 500 yards away. The Estate is elegantly furnished, has a feeling of comfort and style and is very suitable for a large group of people, staying together but is also perfect for a couple or smaller family. The lighting is subtle and indirect giving the large reception area a feeling of space and tranquility. The living space is attractively decorated in bright white South Beach Miami style. This Florida vacation Estate is on two levels with white travertine polished marble flooring throughout on the first floor. A paved pool patio surrounds the villa towards the golf course with endless views and with seating up to 16 people. a wide-screen 50 inch HD Plasma TV, DVD/VCR, and WI-FI wireless broadband Internet. When you can rent our Architect Designed Luxury DISNEY AREA GOLF VILLA with Pool looking the golf club house. Enjoy Free Wireless Internet - Hi-thread quality Ralph Lauren type linens - American Retro Deco decor Large entertaining patio - Outside BBQ Grill. Stoneybrook West Golf Club – championship golf course with generous fairways and fast greens. For both extreme pleasure and unrelenting challenge. Southern Dunes - designed by Steve Smyers, this course is one of the best public golf courses in the USA and has been Ranked #6 in Golf Digests "Best Courses in the State". Has been awarded a place in Golf Week's “Top 100 Modern Courses” from 1997 – 2000, a 4 ½ Star ranking by Golf Digest and “Top 10 Courses Built In America 1987-1997” honors by Links Magazine. Orange County National Panther Lake & Crooked Cat - top 10 golf facility in the USA rated 4.5 stars by Golf Digest. Playing over rolling meadows, through native pines, around and over wetlands, lakes, and up and down elevation changes of up to 60 feet, it is first and foremost a visual delight, reminding you that natural beauty is one of the main reasons you play golf. Celebration - The renowned father-son team of Robert Trent Jones, Sr. and Jr. sculpted a park-like atmosphere within the natural wetland environment, creating a truly serene golf experience. Rolling terrain that weaves through a series of pristine lakes and periodic clusters of native oak, pine and magnolia. Lake Jovita South - golf at its absolute best with professional tour quality. Interwoven through lakes, ponds, valleys, hills, and lush vegetation make Lake Jovita a premier golfing destination. Top 100 in America by "Golf Business World" and a world-class fifteen-acre practice facility with bunkers and chipping area, a one-acre putting green. Champions Gate Intl - 36 holes designed by International Golf Champion Greg Norman and is the World Headquarters of David Leadbetter Golf Academy. The International, with its authentic links-style golf reminiscent of the great courses of the British Isles. Mission Inn - 36 holes boasting rare tee-to-green elevations of 85 feet, towering forests and sparkling, spring-fed lakes. Both courses hold a 4-star rating and have been recognized as "Best Places to Play", North America, by Golf Digest.